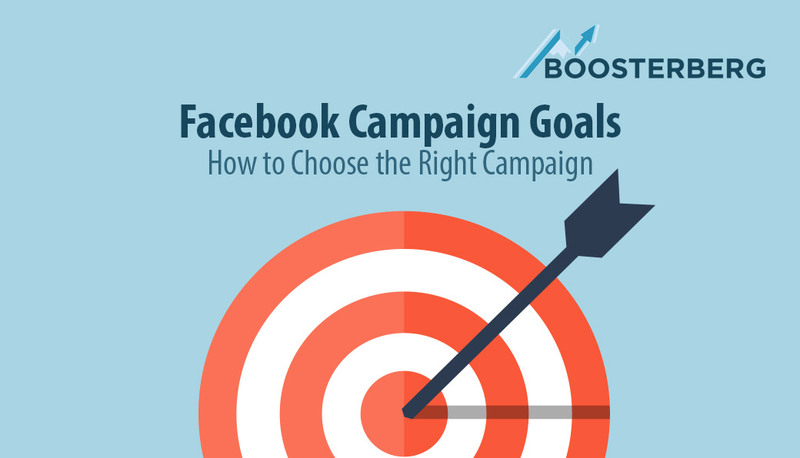 Which Goal is the Right One for My Facebook Campaign? When creating a new campaign, the advertising platform of the social network Facebook offers, similarly to Google Adwords, a choice of goals for a marketing campaign. Firstly, the tool tries to better understand your needs and what type of results you expect from it, secondly, it helps you to choose the best from the options presented. Behind every option, there are certain algorithms that help the ad work so that it brings the best possible results and so that the advertiser is satisfied and invests more finances in it. Brand Awareness – the goal of this campaign should be raising the awareness of a brand. It is mostly the choice of new advertisers who are entering the market for the first time and are not that known to the public. The aim of their advertising and communication on Facebook is to build a community of people who can remember their brand. In the next phase of the campaign, advertisers can try to turn the group into real customers. Local Awareness – is very similar to BRAND AWARENESS campaign, but as the name suggests, it serves mostly on a local level. It is effective for smaller local advertisers gathered in an area. Reach – with this type of campaign, it’s all about reaching the highest number of users – prospective customers. The principle on which Facebook ads work is to define a so-called Frequency cap. It is a variable where the advertiser limits how often an ad should be displayed to the reached user and so it ensures the highest reach. 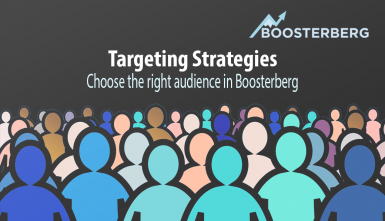 Get hands on Boosterberg and start your 30-day free trial. No obligations. Another main group is CONSIDERATION. These are campaigns more targeted on the customers, where you can assume they are aware of your brand. Traffic – in this case, the main goal is to catch prospective customers somewhere on Facebook, possibly on an external website. The goal of this campaign is used mainly in cases where the advertiser directs the user to a new content and expects the user to interact with it. Engagement – recently, all campaigns concerning post interaction or Facebook page interaction have been added by the social network. Here you can find the campaign to support posts in order to get the most user reach, the campaign to collect new fans for a new Facebook page, campaign to promote events (to detect the interest for an event) and last but not least a campaign to promote OFFERS. In the campaign, the user chooses a product and the discount, which he wants to promote. App Installs – in this case, the advertiser tries to address the users through an ad and bring them to the shop where the advertiser´s app is located with the purpose that the user buys or installs the app. Video Views – are campaigns aimed to boost a video. In this way, the video content can be rather easily and effectively spread among relevant users on Facebook based on a detailed goal. The advantage is that the majority of users has the auto play option set up and so it is easier to address the user with an offer when the ad is captivating enough. Lead Generation – this type of campaign is focused on collecting personal data (leads) based on filling out a form. Usually, there is a “reward” in form of a discount or a prize for filling out the form. The collected data is mostly the phone number, email address, address. The third and the last main group are campaigns aimed at conversions. These are campaign aimed solely at selling a product or a service. The goal is to motivate the end user to a conversion (most often a purchase). Conversions – it is a more advanced campaign type where the advertiser chooses specific conversion events based on his marketing goal. In order to measure the conversions, an active Facebook Pixel code is necessary, in which the conversions are defined. This code needs to be inserted either into an app or into a website, where we want to monitor the conversions. 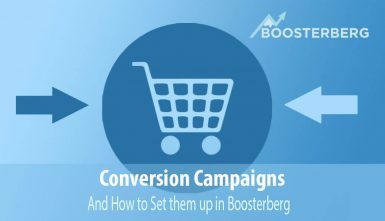 Consequently, the campaign is evaluated based on the number and significance of the conversions. Product Catalogue Sales – help to create the so-called dynamic ads. To use this type of advertising, you need to upload your product feed to the Facebook’s ad system. From this feed, the data will be loaded into the ads. Ads created via this type of campaign can be personalized and have a higher chance to attract prospective clients and persuade them to the final conversion. Store Visits – similar to LOCAL AWARENESS campaigns, the advertiser addresses users with an ad in the surrounding of his business. The purpose of a STORE VISIT campaign is, as opposed to LOCAL AWARENESS, to get potential customers directly into a local brick and mortar shop. The content of the ad is optimized for the store where the customer is located or the one closest to the customer at the moment when the ad reaches him. Various types of campaigns that Facebook offers have the goal to cover all advertiser´s needs and help their business to effectively address the most relevant audience with their ad. So it is very important to set the goal of your marketing campaign even before you create a campaign.